Host Don Meissner helps Jayden Kring land his first lake trout in an episode of "Fishing Behind the Lines" filmed last summer in Oswego. Jayden's father, Coast Guard chief petty officer Rob Kring, was a guest on board Capt. Ed Monette's Cannonball Runner charter. The episode airs May 3 on WPBS Public Television. OSWEGO, NY – The quality and variety of Oswego County’s exceptional fishing opportunities will be featured in several new episodes of “Fishing Behind the Lines” on the North Country’s public broadcasting station, WPBS-TV of Watertown. Season 3 of “Fishing Behind the Lines” will be aired Wednesdays at 7:30 p.m. starting March 29. Host Don Meissner helps Jayden Kring land his first lake trout in an episode of “Fishing Behind the Lines” filmed last summer in Oswego. Jayden’s father, Coast Guard chief petty officer Rob Kring, was a guest on board Capt. Ed Monette’s Cannonball Runner charter. The episode airs May 3 on WPBS Public Television. All episodes will be available for streaming the day after the broadcast premiere at watch.wpbstv.org. “Fishing Behind the Lines” is a 30-minute, 13-part series hosted by long time public television host Don Meissner. The program is sponsored by Oswego County Tourism, Tailwater Lodge, and American Military University with assistance from Fort Drum Public Affairs. Meissner fished for lake trout on Lake Ontario in Oswego with Coast Guard Chief Petty Officer Rob Kring and his six-year-old son, Jayden, in the episode which airs May 3. 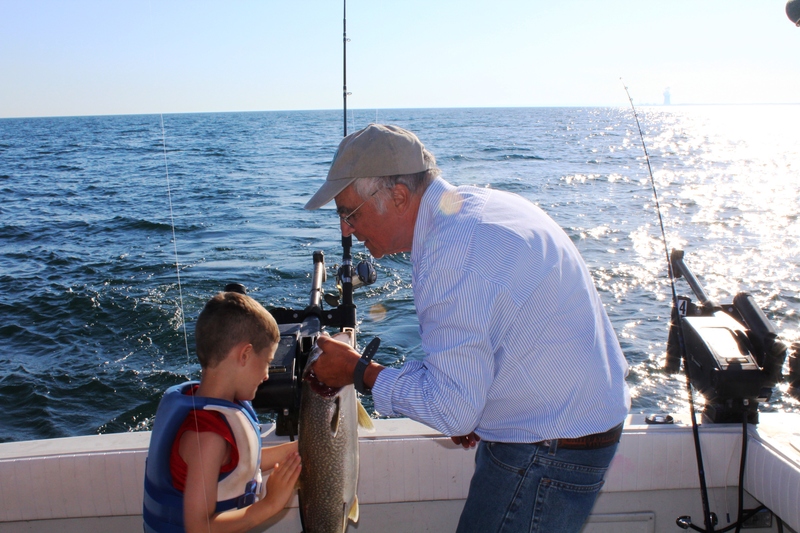 Captain Ed Monette of Cannonball Runner Charters, and his First Mate Hunter, help Jayden catch his first lake trout. Air Force and Army veteran Ben Carter visits downtown Oswego on the June 14 episode where they fish for rainbow and brown trout with local anglers. The third episode, filmed earlier this winter, features ice fishing on Lake Neahtawanta in Fulton. Oswego County Tourism also sponsored the first two seasons of “Fishing Behind the Lines.” Several episodes were filmed on Lake Ontario and the Salmon River. A highlight of the third season is a two-part episode with Alejandro Villanueva and David DeCastro of the Pittsburgh Steelers. Alejandro is the starting left tackle for the Pittsburgh Steelers and a former Airborne Army Ranger who served three combat tours in Afghanistan. In the two-part episode, Alejandro takes friend and Pittsburgh Steeler all-pro right guard David DeCastro fishing for bass and pike. Along the way, Meissner had a chance to talk with Alejandro and learn more about his past, and why he chose to join the military.